PTT Exploration and Production Public Company Limited (PTTEP) represented by Kanit Sangwongwanich, Executive Vice President, Engineering and Development Group, and TOTAL E&P Thailand Limited (TOTAL) represented by Emmanuelle Tutenuit, Managing Director, together signed a Memorandum of Understanding (MOU) for cooperation in Research and Technology Development for E&P development in the future. The ceremony was held at Energy Complex building. Mr. Wisut Punnahitanon, Business Development and Joint Venture Manager, TOTAL; Mrs. Emmanuelle, Mr. Kanit and Vinit Hansamuit, Senior Vice President, Technology and Knowledge Management Division, PTTEP. 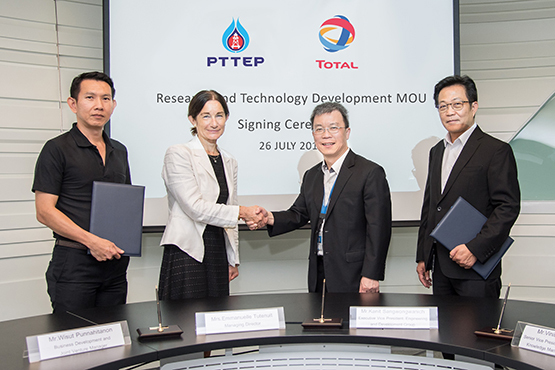 The representatives of both companies expressed their enthusiasm about this agreement which will mark another step forward in a longstanding, successful and friendly partnership between PTTEP and TOTAL. It will pave the way for the companies to jointly develop technology and innovation targeting increased operation efficiency and reduced costs of upstream projects, and at the same time, reducing the environmental footprint as well as creating more value from innovative green technology.